The finding in Demos's report A Place for Pride that 83% of Muslims said they were proud to be a British citizen, compared with the national average of 79%, has been met with surprise in some parts of the press. 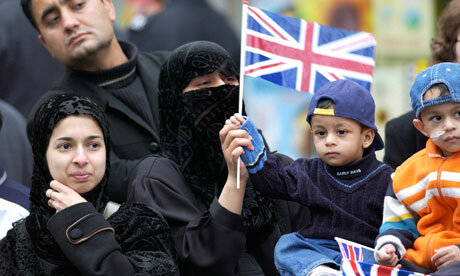 Clearly many British citizens have both a strong religious identity and a strong national identity. Yet it also seems clear that many people see these identities as mutually exclusive. Why is this the case? There is a lot of misinformation about the British Muslim community. In 2009 the Gallup Coexist Index found that only 36% of the British public thought that British Muslims were "loyal to this country" as opposed to 82% of the British Muslim community. The surprise at the findings of Muslim pride in Britain is rooted in a prejudice that leads people to believe that it is paradoxical for someone to hold both their religious and national identities as important. Lazy caricatures of Islam as contradicting many of the rights and values that are seen as quintessentially British – particularly freedom and democracy – only exacerbate this problem. So, how do we tackle the prejudice that leads to this view? We must start by challenging perceptions of faith groups that rely on broad stereotypes, and instead provide people with opportunities for meaningful engagement, where they can meet and learn about each other as individuals. The report quotes a student who participated in Three Faiths Forum's Undergraduate ParliaMentors programme, which gives young people the opportunity to work with students of different faiths and non-religious beliefs on social action projects, and to be mentored by MPs and peers. The "people I worked with, neither of them had even met a Jewish person before. I found it quite daunting but it was good and it helped me in a way to understand who I am as well as to know more about Islam and Christianity. In the end, the things we sometimes fell out about were what we were doing on the project – not God." Finding out that the difficulties that come with working with others are often simply the usual interpersonal challenges is an important part of seeing others as individuals, not just a Muslim, Jew, atheist etc. What we need are more opportunities for this humanising process. If we can find these while people work together on a social cause then this is all to the good. One of the clear implications of the Demos research is that public pride is linked closely with "social engagement, interpersonal trust and volunteerism". If we embrace opportunities to work with people of all faiths and beliefs then we can start to overcome the prejudice that leads to surprise that other people are also proud of Britain. We will, in turn, also give ourselves more reasons for civic pride.